Have you ever visited a high-end resort or community and wondered, "Is there really that many people with that much money out there?" I have. You see millions of dollars being spent on real estate developments with spacious vacation homes being built and just shake your head in awe. In fact, there are quite a few people with a significant amount of money to their name. On May 25, 2005 CNNMoney.com reported that there were 7.5 million millionaires in the United States alone. Don't be discouraged; those of us that are among the 300 million "other" Americans that can't lay claim to the millionaire title love having your company. What if you were fortunate enough to be one of those millionaires though? Where would you choose to have a second home? In the Wild, Wild West there are plenty of great options that present themselves. From trendy locations like Sun Valley and Park City, to the stunning locals of Coeur d'Alene and McCall, life out West can be fantastic. But one area stands alone in its ability to attract more tourists, celebrities, and millionaires than any other; the famously scenic Jackson Hole. Over 3 million people visit Jackson Hole annually to witness first hand the splendor of the towering Teton Mountains, cut powder down the famous ski hills, visit the nearby national parks and enjoy all the wonderful outdoor activities the area affords. 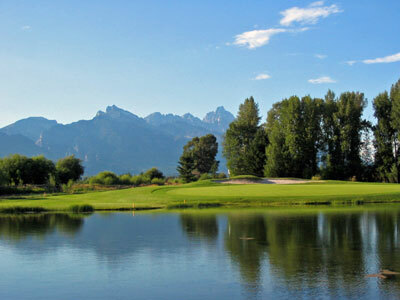 But just recently has the greater Jackson Hole area made a big push in the golf course world. 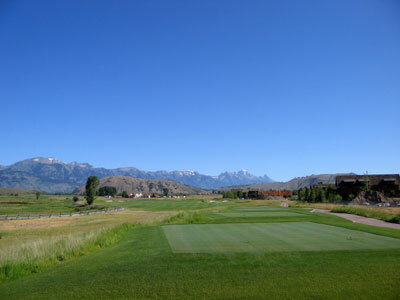 The past few years has seen a $15 million renovation at the Jackson Hole Golf and Tennis Club, the additions of Headwaters at Teton Springs and the reversible routing at Teton Reserve in Victor, the Scottish links layout at the Links at Teton Peaks in Driggs, and two new beautiful clubs in Jackson known as 3 Creek Ranch and Snake River Sporting Club. This past summer I took a day-long trip where I had the opportunity to play at Jackson's newest private courses. What I found was that not only has Jackson become a world class golf destination, but that 3 Creek Ranch and Snake River offer two completely different experiences. The day starts with my alarm clock blaring before the sun has decided to rise for the day. My wife (Stacy) manages to sleep through the disturbing alarm output, probably because she was up with our new baby (Makaya) a handful of times throughout the night and her motherly instincts allow her to wake up at the smallest sound of a baby crying yet able to mute out the rest of the world if necessary. I shower, get dressed, and grab a banana and Clif Bar for breakfast as the caravan holding my RJay and my Dad arrive at my house to load up my clubs so we can hit the road north to stunning Teton Valley. Conversation is typical on the way up as we find out I went without breakfast, R.Jay had a bowl of cereal, and my Dad managed to make himself a four course meal consisting of three scrambled eggs, a bowl of cereal with a banana sliced on top, two slices of toast courtesy of my wife's homemade bread, and a bowl of fruit with a glass of milk. As we roll down the road we pass nearly a hundred bicyclists in a race that finishes in the Teton Valley. With temperatures still below 50 degrees I'm glad I'm sitting in the friendly confines of a car and not sitting on a bicycle seat getting my rear sore. Anticipation for the first tee builds as we approach Jackson Hole where 3 Creek Ranch will be our first stop and Snake River Sporting Club will be the afternoon round. After getting past the security guard we drive back to the bag drop where a pair of helpful gents greet us and unload our clubs before escorting us to the practice range. 3 Creek Ranch opened in 2005 as a Rees Jones design and was ranked as the 5th "Best New Private Course in America" by Golf Digest after its debut season. With tees ranging from about 5500 - 7700 yards, 3 Creek can test the "big boys" while still offering playability to all levels of players. Feeling manly, I walk back to the tips and drag RJay back with me. R.Jay is reluctant to step back to the tips since our last trip to the Teton area included playing the tips at Headwaters at Teton Springs in a stiff wind where we all walked off the course with our tails between our legs after scoring humbling high scores that will go undisclosed. Everything at the course is first class. The leather seated golf carts are brand new and travel along the paths quickly and quietly. They are equipped with chilled towels to keep us cool throughout the round as well as privately labeled 3 Creek Ranch bottled water. Scorecards are printed each day with the individual hole distances being measure precisely based on the tee markers and pin placements of the day. In addition, conditions are simply perfect. With an excellent maintenance staff and very few rounds played throughout the season, few places in the country can compete with the overall turf conditions and pure rolling greens. The course is laid out on relatively flat terrain and Rees Jones did a fantastic job of making the course very playable with generous fairways, manageable forced carries, and straight-forward holes that don't require blind shots or too much guessing. Plenty of water hazards and bunkers are scattered throughout the course and views of the Teton Mountains are dynamic, especially on the back nine. The best stretch of holes on the course is the final four holes of the day with the climax being the par five 18th. 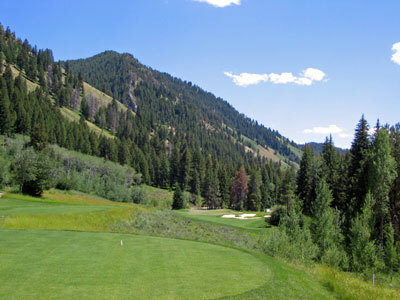 The 15th and 17th holes are both dramatic downhill par 3s that are over 240 yards each and run in different directions while the 16th hole is a nearly 500 yard par four with the Teton Mountains engulfing the background. The 18th is a 629 yard dogleg left par five that boasts eight bunkers and finishes at a green that offers the best views of the Tetons on the entire course. At round's end the course won as our scores were held in check and few birdies were yielded. With precious few minutes to make our afternoon tee time we load in and cruise over to the Snake River Sporting Club. As we arrive at the temporary clubhouse, the staff informs us that we missed course designer and golf legend Tom Weiskopf by a mere 20 minutes as he was up playing the course to see how his work was coming along. On the first tee we are greeted by a friendly gal who makes us all sandwiches for lunch and encourages us to enjoy our round. Right off the bat it is clear that the terrain at Snake River is vastly different from the wide open marsh lands of 3 Creek. The course runs along the base of a mountain and throughout the rugged canyon wetlands and heavy trees featured throughout the property found next to the Snake River. Fairways are much tighter, conditions very firm, and the elevation changes present more difficult situations than 3 Creek affords. It is almost unheard of for the 2nd hole to be considered the signature hole of the course, but the drama occurs early with this 322 yard blind par four. Driveable par fours are clearly Tom Weiskopf favorite holes to design since they are found at virtually every course he's acted as architect. The hole is built on a steep side hill sloping from left to right while dropping 50 feet from tee to green and featuring the most difficult, contoured green I've ever had to challenge. That is saying a lot considering I didn't think a golf ball could go on a crazier roller coaster ride after having played the 12th green at Trump National L.A. following the Donald's redesign, but even that green meets its match with Snake River's 2nd green. I've never been so happy with a 3-putt in my life. The bunkers at Snake River feature jagged edges and are reminiscent of work the late, great Alister MacKenzie would have done. One of the most interesting bunkers on the course though is the sod-stacked pot bunker resting in front of the green at the par three 4th hole. The lip is very steep and it begs you to stay out of it, but R.Jay's tee shot found a way into the bunker anyway. Wanting to catch his almost certain humiliating attempt to get out of the bunker on film, I bust out my video camera to seize the moment. To my astonishment, and probably R.Jay's, he manages to blast out of the bunker and the ball lips out and prevents him from securing a birdie that none of us would have heard the end of. In January, the Snake River Sporting Club was named by Golf Digest as the "2nd Best New Private Course in America" after its first full season in 2007. The course is very challenging and requires solid shotmaking in order to score well and not lose a dozen balls throughout the round. Low handicap golfers will love the challenge of the hard and fast conditions while everyone who steps on the property will be impressed with the terrain and views. 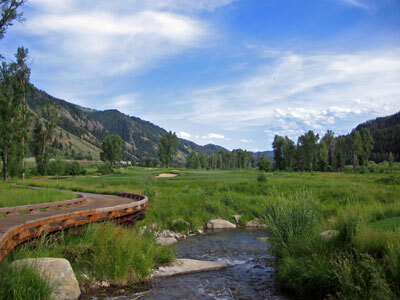 In contrast, the treeless 3 Creek Ranch is a friendlier design that appeals to a wider demographic of golfers. The posh clubhouse and conditions are commendable and service is second to none. So if you are one of the 7.5 million millionaires in America looking for a vacation home then roll on up to Jackson where some excellent golf clubs and unique experiences await. If you are one of the 300 million "other" Americans not so financially fortunate, then start doing some networking until you have an invitation to experience Jackson's newest golf offerings; it will certainly be worth your efforts. Who knows, you may even have a "Tiger sighting" since Mr. Woods has already purchased property at the prestigious 3 Creek Ranch. Good Luck! Want to see more photos of 3 Creek Ranch and Snake River Sporting Club? 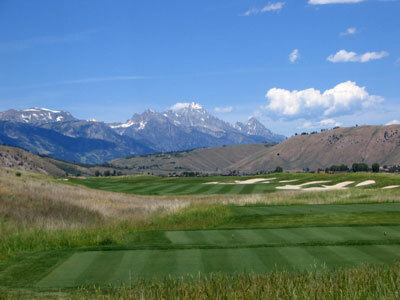 Click on the link to go to our Wyoming Golf Course Photos section.